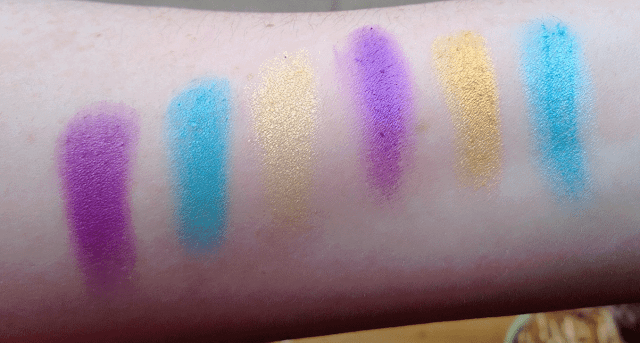 After loving the Heaven and Earth palette, which you can see my review here, I couldn't wait to swatch and show you the Poptastic palette. I love bright colours and these looked right up my street. These are all metallic/shimmery shades, it's a very subtle shimmer so all shades are very wearable. Nothing too in your face or over glittery. On the top half of the palette we have two blues, two purples and two yellows. From left to right we first have a gorgeous purple. This is one of the more metallic/shimmery shades, but as I said, the shimmer is subtle. This is more of a warm purple which is pretty and looks lovely on the lids. It's not too bright or to garish and I think MUA have done really well with this shade. The next colour is a bright yet pale blue which I am in love with. It almost has a matte look to it, but still has slight shimmer to it. I love how vivid this colour is and has great colour payoff. I'm in love with this colour, and because of my blue eyes it suits me really well. Next we have a pretty shimmery yellow. This delivers more of a sheer colour but is so pretty and so delicate. When used lightly it gives my eyes a subtle, pretty gold wash of colour. We then come to a pretty brighter purple compared to the first one. This one has a blue shimmer to it which would look lovely on paler complexions. This again has more of a subtle colour but is very buildable. We then have a gorgeous gold which I am in love with. It's more of a yellowy gold with a bronze shimmer which I love. It has amazing colour payoff and is my favourite colour of the palette and I can't wait to use it more. Last on this row we have another blue. It's very similar to the second one on this row but is slightly less green toned and has so much shimmer and beautiful colour payoff. The first on the bottom row is a pretty green with hints of blue. It's not overly shimmery and has nice payoff. It's very similar to MUA's Eye Dust in Shade 3 which I will be swatching fairly soon. The next one is a crazy bright pink which again appears matte but has a slight shimmer to this. I love how bright and pigmented this colour is and I can't wait to apply it to more brighter make up looks. The next colour is another blue, and the colour is very much in between the first blue on this row, and the second colour on the top row. It's slightly more darker than the second colour on the top row and has a slight green tone to it. This again looks matte but has a subtle shimmer to it. The next one along is a bright pink which is slightly whiter than the second colour on this row. It's much more shimmery and has more of a subtle colour which I really like. Next we have a gorgeous blue which I see as a 'normal' blue. It's one of the colours that again looks matte but has a slight shimmer to it. I love the colour of this and it has great pigmentation. The last colour on this row is similar to that one but is more darker and more of a navy but has more shimmer. So that's the Poptastic Palette in a nut shell! It's got some really love colours and some great colour payoff. Don't be frightened by how bright this is, there's still some really lovely colours in here that are so pretty. This is going to be in some bright make up looks in the near future! Get yours from Superdrug for a very affordable £4! What is your facourite MUA palette? I'd love to hear from you and I reply to all messages. wow those colours are amazingly pigmented! Have you thought about posting a look with them? 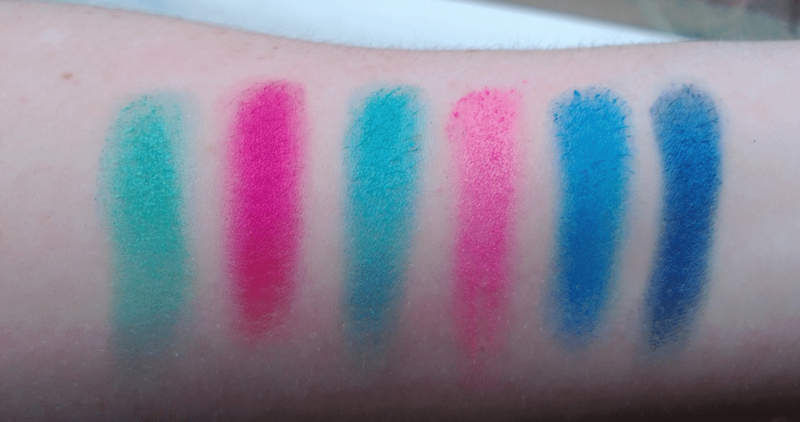 These colours look so gorgeous and pigmented! I wouldn't know how to wear these as I rarely wear eyeshadows and only neutral shades. I really like bright eyeshadows but these just look too much, I'd love to see how you wear them? Wow that's really affordable. So many colours in there. But I tend to use warm shades like brown, golden etc. Maybe I should start experimenting with blues and greens. This is what I'm thinking about all the time...still kind of prudent though. wow look at those colours! Would be great to use to do an eye liner of different colours, really like the gold too.